Almost 50 years’ experience within the field of structural engineering. Between 1969-1975 design of concrete structures and head of design within the precast industry. Between 1975-1985, research, teaching and laboratory leadership in structural engineering at the Luleå University of Technology. Between 1985-1995, head of the Building Structures Section at the Swedish National Testing and Research Institute and also adjunct professor of Fracture mechanics of concrete structures at Chalmers University of Technology. Between 1995-2012 professor and head of Concrete Structures at Chalmers University of Technology. In addition between 1995-2000 head of the activities on the Swedish market for the Norwegian consultant company Offshore Design A.S. 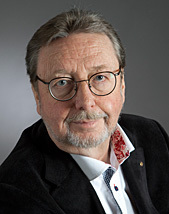 Between 1998-2002, also head of the Department of Structural Engineering at Chalmers and also vice-dean of the School of Civil Enginee¬ring at Chalmers and during 2002 also pro-dean of the School of Civil Engineering at Chalmers. Between 2003-2004 head of the Department of Structural Enginee¬ring and Mecha¬nics at Chalmers and between 2005-2012 head of the Department of Structural Engineering at Chalmers. From 2013 professor of Concrete Structures at Chalmers (part time) and also program manager of BBT (Branschsamverkan Byggnadsverk Transportsektorn). Has been active in a number of national and interna¬tional committees in the field of structural engineering. Has been responsible for numerous research projects dealing with mechanical behaviour and modelling of concrete structures. Have special interest and expertise in non-linear fracture mechanics, FE-analyses, fatigue, laboratory experiments and also the combination of modelling and experimental work in a strategic way. Det kan finnas fler projekt där Kent Gylltoft medverkar, men du måste vara inloggad som anställd på Chalmers för att kunna se dem.